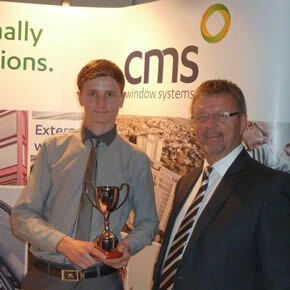 CMS Window Systems has offered its support to the next generation of local authority maintenance and repair engineers by sponsoring the 2015 APSE Housing and Building Maintenance Apprentice of the Year Awards. Operating from a recycling and manufacturing facility near Glasgow, CMS manufactures windows, doors and curtain walling. As a cladding and external wall insulation installer, the company also provides a 360-degree building envelope solution from design through manufacture, installation and aftercare. Having provided almost 100 Modern Apprenticeships in the last nine years, CMS is amongst the top apprenticeships providers in Scotland’s manufacturing sector. By supporting the Association for Public Service Excellence’s (APSE) work, it is reflecting its own commitment to providing career opportunities for young workers. CMS believes that it is important to equip young maintenance workers with the correct skills and support to ensure that the UK’s future homes and public buildings are designed, built and maintained proficiently. As sponsor of the ‘best male apprentice’ in the electrical and mechanical category, the company was given the honour of presenting the award to the winner, Kingstown Works’ Ryan Gagg. CMS Window Systems’ MD, Andy Kerr, has offered his congratulations to Ryan and Kingstown Works for their success at the awards.